If you don’t leverage all of the Taplist.io options (Show producer, Show description, Show style, Show rating, Show OG, Show FG, Show SRM, …), the keg image (in the absense of an override tap image) is disproportionately large. It unnecessarily restricts the number of taps you can fit on a page. 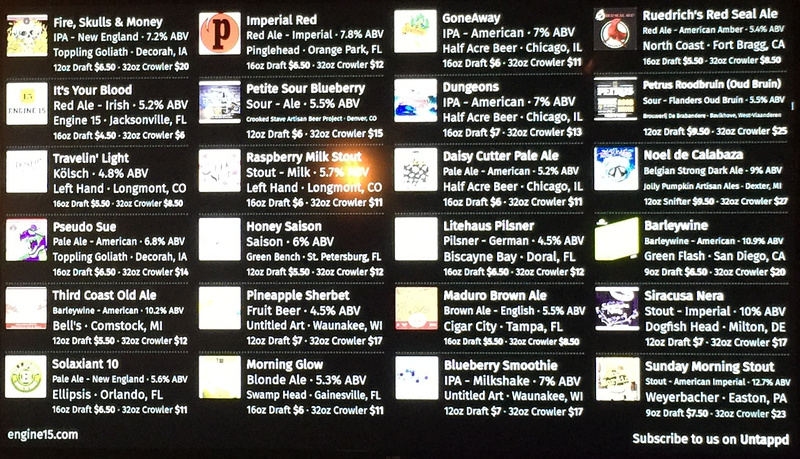 Refer to the normal keg image corresponding to taps 3 and 7 in the figure (below). I’d like to propose either: 1. the keg image size should automatically be adjusted to match the size of the selected options; and/or 2. (preferred) allow the user to manually configure the keg image size (e.g., Zoom %). With taps 1, 2, 4, 5, 6 and 8, I’ve depicted what the new keg level indicator might look like. In addition to showing the relative keg level, the keg level is color-coded (>= 50% - green, >= 30% - yellow, >= 10% - orange, else red). Personally, I don’t have a preference whether the keg level is color-coded. 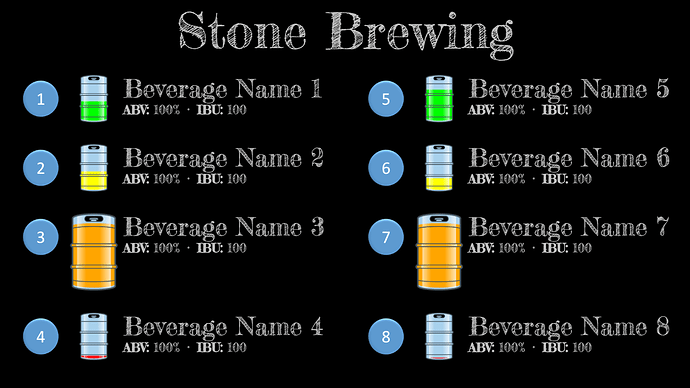 With color-coding, the keg level really “pops”, however, the keg image no longer conveys the configured beverage color. I’ll take whatever results in Taplist.io keg level support being released sooner than later. How about a CSS editor? I’d like to propose either: 1. the keg image size should automatically be adjusted to match the size of the selected options; and/or 2. (preferred) allow the user to manually configure the keg image size (e.g., Zoom %). I think yours are the logical two options: Deal with the different permutations, automatically, better (which becomes a factorially harder problem as we add more options), or, add workaround options to the menu for each parameter (which just puts the problem on you the end-user, but still leaves us with an ever-growing list of options). To date, in Dense, I’ve done a mix of both. But I think there is a third option that I’m leaning increasingly towards: Just make it far easier to build, customize, and share different themes which make fundamentally different layout choices. In addition to major differences, the same platform could be use to make more modest ones. The second benefit of this is, everyone can be developer: no need to wait for mikey to fix problems like that. Of course my assumption is only a fraction of folks will have the technical aptitude or interest to tweak or build a theme, but even a small such minority could have a profoundly broad positive impact and reach on the whole user base - and pave the path for & influence future “built in” theme options. Sold! I changed the Topic Title to “Build, Customize and Share Themes”. 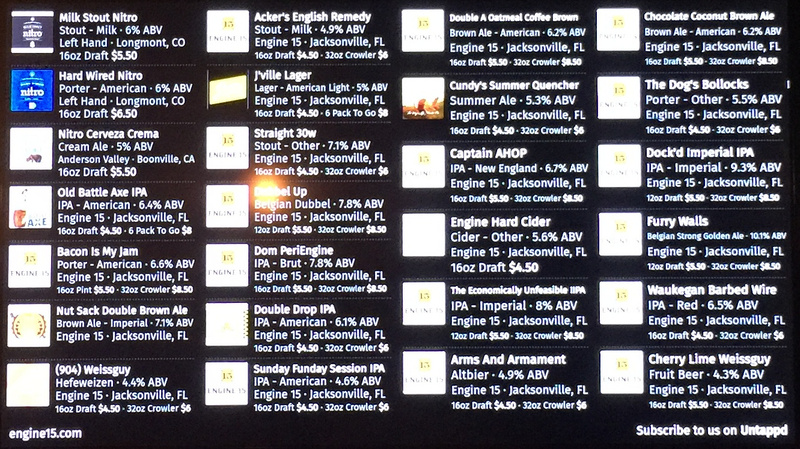 @mikey if you were to build some form of template engine and make all of the available display options template tags such as [abv], [beer_logo], [keg_image] etc and then allow custom CSS it would unlock great potential for custom / community themes to be created. That’s definitely the plan! In fact, it’s they way things work under the hood. There is some trickier stuff to get right, but the basics have fallen into place under the hood. In fact, there are just one or two loose ends to go… hang tight! 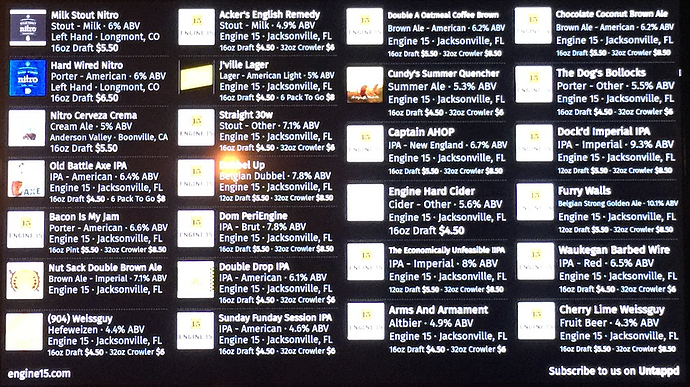 I just wanted to emphasize the theme … 28 beers on one menu and 24 beers on the other. 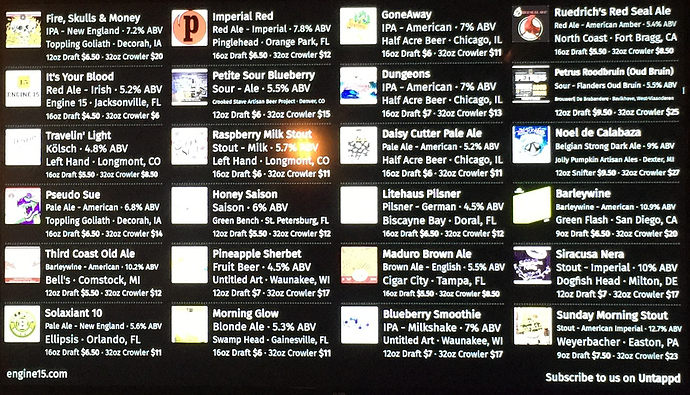 You can see the information displayed in conjunction with each beer. This is a job for the soon-to-be-released Taplist.io custom theme editor!